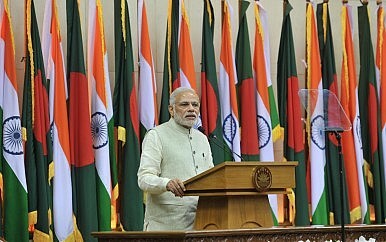 Narendra Modi speaking in Bangladesh on June 6, 2015. India Plucks a Pearl from China's 'String' in Bangladesh? Indian cargo vessels will have access to Chittagong port, long seen as one of China’s “pearls” on the Indian Ocean. Indian Prime Minister Narendra Modi is in Bangladesh this weekend, where he signed, among other agreements, a resolution of the long-standing land border dispute between the two countries. Modi and Bangladeshi Prime Minister Sheikh Hasina signed 20 agreements and memorandums of understanding on issues as diverse as infrastructure, energy, health, and education. The two leaders additionally consulted on counter-terrorism cooperation, boosting trade, and people-to-people exchanges between the two countries. Modi and Hasina additionally broached the sensitive issue of Teesta River water-sharing. On the security front, one of the more interesting agreements to emerge from Modi’s trip so far has been a bilateral agreement that will grant Indian cargo vessels use of the China-backed Chittagong port and Mongla port in Bangladesh. This agreement was reportedly under discussion between the two sides and scheduled to have been signed as early as 2011. The port facility at Chittagong in Bangladesh has long been included on the list of China-backed ports (Gwadar in Pakistan, Hambantota in Sri lanka, Marao in the Maldives, and Kyaukpyu in Myanmar are the other notable mentions) in Beijing’s “string of pearls.” For Indian civilian vessels to have access to these ports is an important development, not least because it showcases growing trust between India and Bangladesh, but also because it may assuage Indian fears about the depth of China’s influence in Dhaka. Those eager to see Indian Navy ships dock at Chittagong may find themselves waiting: that may be too much to ask of Bangladesh for the foreseeable future (certainly given domestic political sensitivities regarding perceptions that the Hasina government is kowtowing to New Delhi). Chittagong aside, China is exploring a deep-water facility at Sonadia, off Bangladesh’s Cox’s Bazar coast, but this project remains in its infancy with viability issues. I’m not quite sure this agreement has precisely the “huge strategic implications” the Times of India notes, but it serves as a reminder of the extent to which Indian perceptions of a Chinese “string of pearls” are often oversold. The strategic implications would be more severe if this agreement had the effect of offending Beijing or distancing Bangladesh and China, but none of that seems to be true for the moment. For New Delhi, the concern seems to be shifting from port facilities underwritten by China to the People Liberation Army-Navy’s (PLAN) broader operations in the area. As the U.S. Department of Defense confirmed earlier this year, China’s Song- and Shang-class submarines are operating in the Indian Ocean. Additionally, as China acknowledges by its own admission per its 2015 white paper, it is seeking a more global role for the PLAN. If anything, China’s base in Djibouti might be the closest thing to what Indian strategic thinkers envision when they hear about a “string of pearls.” In any case, with the PLAN growing increasingly comfortable operating westward into the Indian Ocean, India’s recent overtures with Bangladesh and Indian Ocean island states will be important: India will need all the partners it can find in its neighborhood to remain vigilant as China’s navy goes global. What are the key factors limiting and driving Indian foreign policy?